Step-by-step instructions for selecting, repairing, improving, and selling highly profitable "fixer-uppers." Shows which price ranges offer the highest profit-to-investment ratios, which neighborhoods offer the best return, practical directions for repairs, and tips on dealing with buyers, sellers, and real estate agents. Shows you how to determine your profit before you buy, what "bargains" to avoid, and how to make simple, profitable, inexpensive upgrades. There are probably as many ways to make money in real estate as there are people in the business. It's an enormous field, with many occupations and hundreds of specialties. All offer opportunities for those who know how to take advantage of them. Your local library probably has a shelf of books on the subject. Some are good, some aren't. Many emphasize the financial side of real estate: making complicated deals to buy low and sell high, without doing any improvement work on the property. That isn't how to make a living in this business. So what could I possibly offer that's new, that you haven't heard before? I'll tell you. I'm an investor/remodeler. Notice that "investor" comes first. I'm in the business of making money from homes that I buy, fix up, and sell. Not just any home, not just any fix up, and not just any sale, mind you. It has to be done exactly right to make the right kind of money. And I do make money, plenty of it. I have to, it's my job. It's all I do. If I don't make money on my sales, I don't eat. If you're interested in remodeling homes that you've bought for resale, this book is for you. My approach is simple, it works, it's low-risk, and it pays well. It's even fun - most of the time. I'm going to explain in detail, exactly how I make a good living in this business. I've learned a few things in the last 12 years. I've made some mistakes, taken a few wrong turns and stumbled more than once. But I've got most of the kinks out now and I see opportunities almost everywhere, in every part of the country, in hundreds, maybe thousands of communities. What I do isn't unique. I think almost anyone could do it. Of course, it helps to know something about building and construction trades. I worked as a tradesman before quitting to do the work I do now. But if you’ve got some background in construction, a little cash, and are willing to get your hands dirty, this may be a good-paying career for you. On the chance that I’m right, I hope you’ll stick with me long enough to consider my approach. Residential remodeling is very big. The home remodeling business is an enormous industry - not quite as big as new home construction, but much more steady and growing much faster. Many communities are passing no growth or slow growth initiatives to limit new housing. This is bad news for new home builders, but great for remodelers. These initiatives will force people to buy older homes and remodel them, and builders to look carefully at remodeling for their future. As the housing stock in this country grows older, the remodeling industry will grow with it. I'm told that in Europe, home remodeling is a much bigger industry than new home construction. We may see the same thing happen here during your lifetime. Most homes are remodeled either by professional builders working for the owner, or by an owner who has the time and talent to do the work. Both the talented amateur and the professional remodeler have the same goal in mind - creating the nicest home possible for the owners' use. And there's nothing wrong with that - an owner with the desire and money to pay deserves as much. If you're like most people, you're willing to spend more when it's you that gets the benefit. You want to please yourself and your family. The little extras in your life are worth the cost. "Who cares if the sink costs $2,000," you say. "It's exactly the one my wife wants." My approach is different. As I said, I'm an investor/remodeler. My focus is minimizing the inputs to maximize the output. I've discovered that doing more work doesn't guarantee that I'll make more money. On each home I fix up, there's a point beyond which the cost of additional work can't be recovered on sale. Knowing how much to spend and where to spend it is one of the secrets I’m going to share with you. Knowing what I know makes me less work-oriented than most remodelers, whether professional or amateur. It also affects the focus of this book. Most of the remodeling books I’ve seen approach the subject from the point of view of the work to be done. The authors assume that you have to work more to make more money or make the home more attractive and functional. The harder you work, the better you’ve done. That isn’t what I’ve learned. Another reason you may want to try my approach is that I'm writing from experience. Many books are written by people who don't actually do the work they write about. They just like to talk about it, or maybe they just like to write books. They sit at their word-processing terminals and write about the way they figure it ought to be, or the way they imagine it is. There's little first-hand information in books like that. It' s possible to write a book from what you learn in books or magazines. I haven't done that. What you find between the covers of this book is all original and all based on my own experience. With very few exceptions, I'm only going to tell you what works for me - and sometimes about what didn't work for me. I'm not going to recommend anything unless I've tried it and know it works. And for good reason. Even some of my best ideas turned out to be flops. There are a couple of exceptions that I couldn't resist. But I'll clearly identify them as possibilities you might want to consider - not what I'm recommending. Buying, remodeling, and selling homes is a big subject. To help you understand all the details, I'll go through the entire process with you step-by-step. We'll cover each subject in logical order, the same order you'll follow when you try it. The first subject we'll cover is how to select the right property. This is probably the most important part of the entire process. I'll suggest a procedure for evaluating the properties available and the criteria you'll use when making the final choice. Then we'll go into financing. How are you going to pay for the property? This can be a real problem. Many people who would like to buy and remodel houses can't because they don't have enough cash. I'll suggest some available options if your cash is limited. Once you have the property, what should you fix and how should you fix it? I’ll go through most of the common repair problems you can expect to run into, and suggest some good ways to deal with them. What about improvements? How can you bring your run-down, out-of-date house up to the standards we've come to expect in a modem home? Improvements can be very expensive. Some are worthwhile and some are a waste of money. I’ll help you decide which is which. Nobody likes an ugly house! How can you make your house beautiful and desirable, so it brings top dollar, and yet not spend a fortune doing it? I'll explain inexpensive ways to turn a sow's ear into a silk purse. We'll finish up with a section on selling your house. You won't get your profit until you find a buyer. I’ll go into the options available to you for finding one, and closing the deal. Now that you know what's ahead, let's get started. I hope you're ready to charge into the world of real estate and find that diamond in the rough just waiting for you to come along. I believe the surest way to make money in real estate is to pick one type of property and specialize in it. There isn't one real estate industry in America. There's a million of them, one in each neighborhood and within neighborhoods, one for each type of home. It's impossible to know about every kind of property available on the market in every community. There are just too many. My specialty is single-family homes located near the community where I live. I don't do commercial property, I don't do multi-family, and I don't do construction contracting. I work in big-city suburbs, not small towns or resort areas. I've chosen my specialty for several reasons, which I’ll discuss a little later. I concentrate on single-family homes in a limited area. I've come to know my market. I know what buyers want in their homes. I know the best price range for maximum resale value. I know which streets and what neighborhoods are a good choice and which are a bad choice. I don't experiment with different types of property. I'd rather do a good job in a limited area with a certain type of home than run the risk of getting wiped out in unfamiliar territory. Many people, especially tradespeople, ask me why I buy the homes I remodel. Why risk my own money? Why take on the aggravation of being totally responsible for a major project? Is it really worth it? My answer is a resounding "YES!" and for a number of reasons. I’ll explain them one at a time. First of all, as you might guess, there's good money to be made from buying and remodeling homes. Doing most of your own work compounds your profits. I'll explain. You probably know of at least one investor who buys houses and hires contractors to remodel them. The contractors hire tradesmen to do the actual work. The tradesmen are paid a wage for their time, the contractor earns a share for his part of the job, and the investor makes a profit on the sale of the house, less expenses. If investor/remodelers are active in your community, most are working this way. Many real estate investors make a good living like this. If you don't have the time and don't know anything about construction, maybe that's all you can do. Projects are being done this way every day and in every part of the country. I guess that proves there's plenty of profit in it. William Nickerson, the famous author of real-estate books, suggests exactly this approach. He hires everything out. His book, How I Turned $1,000 into $1,000,000 in Real Estate, is a classic. The information in the book is as valuable today as it was when it was written in 1959. It's one of the few real-estate books that I recommend. But what if you do some or most of the work yourself? If you buy the house, you're the investor. If you organize the work, you're the contractor. If you do some or all the work yourself, you're the tradesman. Therefore, you're entitled to the wages paid to the contractor and the tradesman, as well as the investor's profit. You're paid triple for every hour of work you put in on your project! 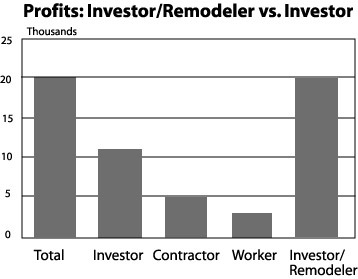 Figure 1-1 shows the difference in profit margin between an investor and an investor/remodeler. I've said that there's good money to be made in this business. So why don't I hire tradesmen to do all the work? Here's my answer: Absentee investor/remodelers lose control. They aren't there to make the thousands of decisions that are required for every job. They pay too much for supervision, for materials and for labor when they rely on someone else to do the work for them. My advice is to do what you can and what you enjoy. You’ll end up putting far more profit in your pocket. If you're a contractor or a tradesman, you'll have slow periods. There won't be enough work to keep you busy. If you've ever watched your bills pile up while you wait for work that doesn't come in, you know what an uneasy feeling that is. Remodeling your own houses can put an end to that feeling. You create your own job and you're your own boss. You can plan your work to stay busy for weeks or even months at a time. What if you're too busy to have time for your project? No problem. Your own house can wait a week or so. Of course, it isn't a good idea to leave it unfinished for too long. After all, you have monthly payments. But a week lost now or then won't make much difference. This flexibility is important, especially if you work at another job. You can buy and remodel homes at your convenience. If the work load varies during the year at your regular job, plan work on your remodeling project when you have time. You control the work. The work doesn't control you. Another way to guarantee a steady income from your investments is to plan on renting out some of your completed houses. If you've selected a good property, the monthly mortgage payment and expenses will be less than the potential rent on the property. Rent it instead of selling. This can benefit you in several ways. You'll have a steady flow of money coming in every month, year after year, and rental property offers you a good tax break. Believe me, it isn't difficult to accumulate enough rental income to cover all your basic living expenses. That's exactly what I do. My rental property provides the income I need to cover my monthly bills. I use the profits from the properties I fix up and sell for spending money and new investments. Even if I don't do any work one month, my expenses are paid and I'll still be able to eat. When you're self-employed you don't get sick days, vacation days, unemployment compensation, or any of the other fringe benefits that make life more secure. However, rental income goes a long way towards solving that problem. If you don't work you'll make less money, but you won't starve. Here's another advantage you have as an investor/remodeler. You get in, do your work and get out. You buy a house, fix it up, sell it, and then you're done. If you want, you can then go on and buy another property; or you can take some time off for a vacation; or you can go back to your regular job. It's your choice. Buying and remodeling houses isn't a continuing commitment. You're only committed to one house at a time. It gives you a more flexible work schedule than anyone working for wages. If you're a remodeling contractor, you're already your own boss, at least in a sense. Of course, you work for yourself. But in fact, your customers are your boss. They determine when you work, and how you work, and what has to be done over. Let's face it, you won't be in business very long if you don't do what your customers want. Unfortunately, some customers can be very difficult - nit-picking, unreasonable, and fault-finding. You know what I mean. They can take all the fun out of your work. When you're remodeling your own property, you're the customer. You can do anything you want, and do it your way. You don't have to justify your costs, or have your best ideas rejected, or good work ruined by someone else's whims. What you want is what you get. You're responsible only to the future buyer. And you may not meet that buyer until the project is finished. For me, this alone makes buying and remodeling houses worthwhile. Of course, sooner or later you're going to have to deal with customers. That is, if you want to sell the house. But all your customers ever see is the finished product. They won't know what the house looked like before you started or how you managed to make it as nice as it is. Better yet, they won't care. You're offering them a good house for a good price. They're happy, and you're happy. You're making a good profit. Other professions- If you're a tradesmen or handyman, you may never have been your own boss before. It's a rewarding experience. I spent several years of my life working for other people. I know what it's like to do seemingly pointless tasks because someone higher up has a crazy idea. I also know what it's like to have valuable, creative projects rejected. Well, as your own boss, you don't ever have to put up with that. Sure, being the boss can be a headache at times. You have the final responsibility for everything, and sometimes it won't be pleasant. If there's a job that's so nasty and disgusting that I can't even pay someone else to do it, guess who gets stuck with it? And if I don't make as much on a project as I expected, there's no one to blame except myself. However, just being able to say, "We're going to do it my way, because I'm the boss," makes it all worthwhile. Maybe you feel the same way. While the building code and zoning ordinances vary from city to city , property owners have less restrictions than hired contractors. Most laws, after all, are made to protect the property owners. You only have to worry about the codes which will protect you from yourself! As an owner, you won't need a contractor's license to work on your own property . You will need to get permits for major work, and your work will still have to pass inspection. But many cities issue "owner permits," which are usually very easy to get. A lot of the work you'll be doing may not involve any paperwork at all! As a contractor, you' d need a briefcase full of plans and permits to do any work at all. Many cities require general contractors to use subcontracts for trades like plumbing and electrical work. But many of those same cities will issue you an "owner permit" to do the work yourself. That can save you a lot of money. Of course, you' d better know what you're doing (for your own safety, and to pass inspection). Subcontract anything that's over your head. You're not going to lose anything. You'd have had to do that as a contractor anyway. Another advantage to being both the boss and the owner is that you can organize the work to suit yourself. For instance, you can hire out jobs you don't particularly like, and just do what you enjoy (most of the time). You can do the work in any order you like, although you have to be practical. Some jobs have to be done before others. You wouldn't want to lay carpet before painting, for example. But in most cases you can do what you want, when you want and the way you want. 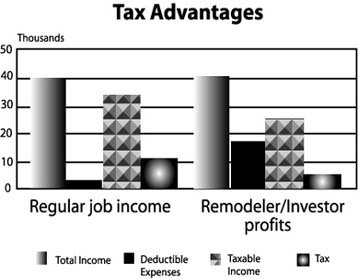 Many tax advantages are available to investor/remodelers. Although the 1986 Tax Reform Act eliminated some of them, enough remain to make buying and remodeling homes worthwhile. In fact, since the Tax Reform Act eliminated so many deductions in other areas, my line of work may actually have come out better by comparison. The profits you make from buying and reselling houses are now taxed as ordinary income, but all your job-related expenses are deductible. This includes mileage and gasoline for the time you spent driving around looking at property; your closing costs, mortgage interest and property taxes; and the cost of the tools and supplies used to fix up the property. Your accountant can probably suggest other deductions you're legally entitled to claim. You'll probably pay less tax on profits from the sale of a house than you would on equivalent income as an employee. See Figure 1-2. The tax benefits are even better with rental property. If you rent a house out, your profit is distributed over many years. If you're on the border of a higher tax bracket, this can be very helpful. Even more helpful is your depreciation allowance on the property. You can deduct a percentage of the cost of your property as depreciation, even if the property's value is going up! The maximum allowable depreciation on rental property at the time of this writing is roughly 3.4 percent per year. The cost of the building can be depreciated over no less than 29.5 years. But I have properties that are increasing in value about 20 percent a year. Yet I can still depreciate them by 3.4 percent a year! You won't be taxed on the appreciation (which is your profit) until you sell the property. That's a good deal. Not as good as it was before the Tax Reform Act, but still good. With rental property you can make a very good income year after year and pay little or no tax at all! You get to keep your money, instead of giving it all to Uncle Sam. There are very few businesses where you can do that . . . legally. I'll go over this in much greater detail in the section on "Rental." I hope by this time you're beginning to see the possibilities. The purpose of this chapter is to whet your appetite for more. And, of course, there's plenty more - more to learn, more opportunities to recognize, and more pitfalls to avoid. If you're ready to dive in and begin at the beginning, go on to Chapter 2. "I started with very little capital, some basic construction skills, a few tools and a willingness to learn and take chances. That was 12 years ago. Since then I've fixed up and sold a lot of homes. In most years the profit on homes I sell is over $100,000. And I own several homes that aren't going to be sold - at least not yet. The rent from these homes gives me a good monthly income, enough to cover living expenses for my family. If I can't work (or just don't want to), I have plenty of income to pay my bills, even if I never remodel another house. That's a nice feeling. But it didn't happen overnight. In my case, it took 12 years. Will you do as well in your present job over the next 12 years? If not, consider trying what I suggest." This book guides you through every step in the spec rehab process: selecting, repairing, improving and selling fixer-uppers. You'll learn which price ranges offer the highest return on your investment, which neighborhoods to consider and which to avoid, what interior and exterior repairs to make, and how to select and deal with buyers, sellers, lenders and real estate agents. There's even a chapter on when - and how - you should keep the renovated house as a rental, to provide steady monthly income. How to determine your cost and profit before you buy. Bargains to avoid and opportunities that can't miss. Repairs and improvements you have to make an any job. Upgrades that charm buyers and guarantee your profit. This isn't a book about real estate finance. It's about when and how to repair structural and mechanical problems, add a room, and correct the defects every old home has in abundance: bad floors, bad ceilings, water damage, a leaking roof and unsightly tile. It's an invaluable guide to the spec rehab business. Draw on the practical knowledge in this manual to build your own part-time or full-time career as a builder-entrepreneur. Lawrence Dworin has been buying and renovating houses since 1978. Over that time he's bought and sold nearly 100 homes, usually - but not always - making a good profit on the sale. Before getting into the spec rehab business, he was a construction tradesman, working for wages on a contractor's payroll. He got tired of doing seemingly pointless tasks because his boss wanted them done. He got discouraged when his best ideas and suggestions were rejected. He discovered that as his own boss he didn't have to put up with that. And he discovered that his hourly and annual income multiplied several times when working for himself, on his own homes and following his own instincts. He wrote this book to help you make the same discovery.